About a week ago I asked the question “What is the perfect digital media player?”. As we wait patiently for the perfect digital media player a popular alternative is an HTPC. Building an HTPC used to be a daunting and expensive task fit for only the bravest of tech geeks. However, with the introduction of the NVidia Ion platform and online content sites such as Hulu gaining popularity HTPCs may be on their way to the mainstream. My own personal frustration with the current crop of digital media players lead me to build two HTPCs for my digital media playback, and forum member Klamath just finished putting together an Ion based HTPC. With an HTPC you have complete control over what UI you use and are not confined to any of the limitations imposed by a standalone media player. If you want to use Windows Media Center an HTPC is the only way to do so alongside your WHS system without involving another PC (for example, you need a PC running Windows Media Center to be able to access Windows Media Center in the Xbox360). 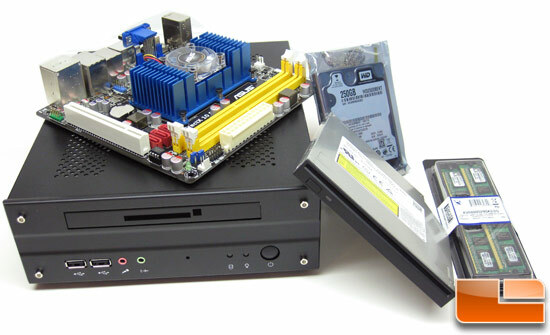 On the downside an HTPC can still come out more expensive then a standalone digital media player and since an HTPC is by its very nature a PC you are responsible for typical PC maintenance/troubleshooting. The Asus motherboard includes the Intel Atom 330 Dual Core processor along with NVidia’s GeForce 9400 GPU. The total cost of the sytem comes out to approximately $577 not including an Operating System or any additional peripherals. Overall, Legit Reviews was able to build an affordable mini-ITX HTPC that consumed very little power (24w at idle and between 29-33w for HD playback) and could easily play Blu-Ray and other high-definition content stutter free. For a full rundown head over to the Legit Reviews guide. I’ve been very tempted by Klamath’s Ion build, though I would probably go for the Asus board as mentioned in the guide above. I’d skip the Blu-Ray drive, though, and save quite a chunk of money. I can always add one down the road. I read the full review and the HD (Matroska) video playback was reported to be jittery. That’s kind of a deal breaker for a 2010 media center PC. Though I have a suspicion it was a setup issue and not a hardware issue. I’d like to see an OS with less overhead installed on the little guy running XBMC to see what that looks like for performance. I think there’s just too much bloat there to get reliable results for that form factor. $417. You can even leave out the hard drive if you’re going to be installing the ‘Live’ version of XBMC on a USB flash drive or something. This system will actually be able to handle full-screen high-def Flash content (like Hulu and Netflix), unlike the ION system. @ pFranzen – I agree, the ASUS build is a little too much $$$ for what you are getting. I would go with something like the ASRock or a similar build that you show. I have been buying Acer x1200 or X3200 systems off ebay. These have the Nvidia 8200 built in with HDMI output. If your lucky enough to get one with the OS intact you can make restore disk and fix the others as they usually come with the License COA still intact but os has been wiped so no harm no foul reinstalling the OS. Usually Under $150 with free shipping, but you will need to re-install if it doesn’t come with the OS acer still sells the restore disk. Or do what I did and buy one with intact OS, and burn the factory restore disk, they have worked on any acer in the Aspire X series so far I just use each COA key off the unit they activate Vist Home Premium and update fine. I have been through about 10 of these and now and personally kept 3x x3200 running vista 64bit buy a cheap LG blu-ray for $60 (Newegg), add Total Media Theater for another $75(arcsoft.com) and I average approx $275 per unit the others went for my family to have full on Blu-ray and upscaled DVD’s plus all the PC functions in a nice quiet smallish box. I use MyMovies V3.04 on my WHS, and MediaCenter on each unit. Well worth it for Super HD/Blu ray/upscaled DVD/YouTube/Hulu/etc… playback. Oops, Almost forgot you can save some bucks as you only need a single blu-ray drive per houshold, just rip it to your WHS with anydvd-HD (Slysoft.com pricey but worth it). This is always a good idea if you have small kids that don’t respect your disks pretty shiny face. Thanks for the comments. I hear ya regarding the small kids, my sons will never know what a dvd looks like!!! I have now a couple of months experience with my htpc and I got quite addicted to it, enough to move me from the windows side to the linux one. - my child: I’m building my own linux all from sources following the instructions at linuxfromscratch. In the current state it boots up full (with networking!) in 15 sec. - XBMC for linux with VDPAU and digital audio output. All in all it works wonderfull, I can play the sample HD Matroska videos in XBMC without any jitters. All other video players (which currently are not supporting VDPAU) failed to play them, but who cares ? XBMC rocks ! Thanks for sharing Florin. XBMC + Linux + Atom330 does seem to be a winning combination. I actually just ordered a core i5 CPU and plan on building a mini-itx, just need to fo thr mini-itx mobo to be released. I will definitely write about my build once it gets going, still trying to decide on a case. Next post: How would you change Windows Home Server?